How might a school (and education, at large) become more agile, more adaptable on a larger scale and shorter time frame? What if we explored recipes that combined ingredients of Collins’ Good to Great (the flywheel effect, “who” before “what,” and the hedgehog concept), Design Thinking and the Japanese concept of “kaizen” (continuous improvement through…Discovery, Interpretation, Ideation, Experimentation, Evolution), and Manuel Lima’s power of networks, which is closely related to Friedman’s flattened world? Could we re-imagine and re-purpose so that school becomes more of a quickly evolving ecosystem that better integrates learners with real-time, real-life, contextual learning and a developing citizen skill-content set that readies learners for the present and future more than for a past that is rapidly fading? To move from the industrial age to the information age to the creativity age, must we synergize processes that can better develop creational momentum? 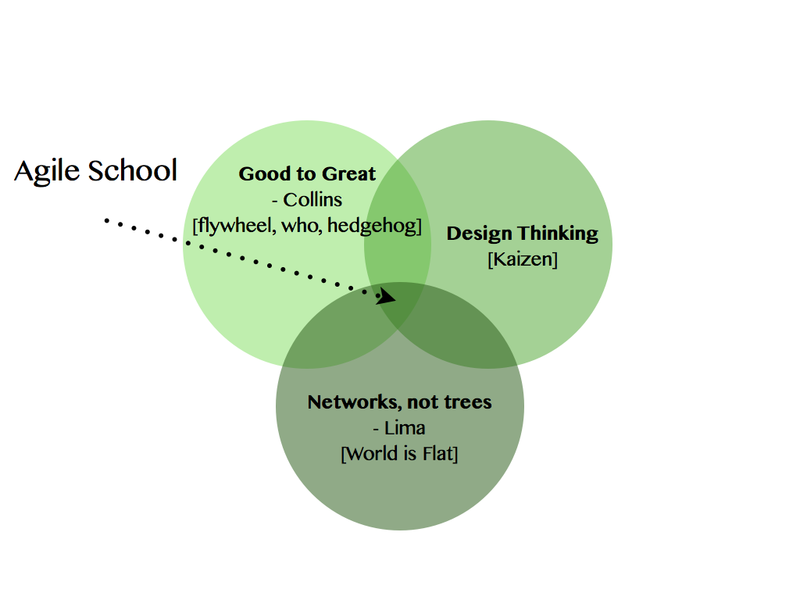 This entry was posted in A Piece of Why-What-How and tagged a piece of how, a piece of what, A piece of why, agile, Collins, design thinking, Good to Great, Jim Collins, kaizen, Manuel Lima, networks, Power of Networks, schools of the future by boadams1. Bookmark the permalink. Really, really important; included in mine on self-evolving learners and organizations http://wp.me/p2gT3m-aD. I think this may be getting close to our key message!